Nearly 50 years have passed since that fateful day in Dallas when JFK was assassinated, and now some new insights have surfaced into those few precious moments in the abrupt transition of presidential power — and it ain’t macho. In a new book on the November 1963 event, The Kennedy Assassination–24 Hours After: Lyndon B. Johnson’s Pivotal First Day as President, by Steven Gillon, paints LBJ as near the break-down point. 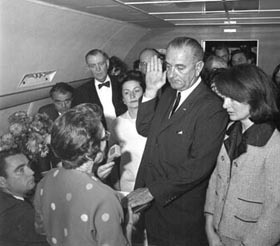 Reportedly, JFK’s military aide, Brigadier General Godfrey McHugh, could not find LBJ on Air Force One after people had told him Johnson was on board — everyone figured he had departed already on Air Force Two as Kennedy and Johnson arrived in Dallas on separate aircraft — until the general checked the shitter in the presidential bedroom. What McHugh claimed to have witnessed next was shocking. “I walked in the toilet, in the powder room, and there he was hiding, with the curtain closed,” McHugh recalled. I soon discovered that McHugh had told a similar story when he spoke by phone with Mark Flanagan, an investigator with the House Select Committee on Assassinations (HSCA). Ironically, McHugh gave the interview to the HSCA a week before he sat down with the Kennedy Library in May 1978. “McHugh had encountered difficulty in locating Johnson but finally discovered him alone,” Flanagan wrote in his summary to the Committee. Author Christopher Anderson claimed that McHugh shared a similar, although slightly more dramatic, version of this story when he interviewed the General for his book Jackie after Jack, published in 1998. In complete contrast to LBJ’s blubberings, Jackie Kennedy was stoic and strong, seemingly in control despite the horror blowing around her. She was only 34 then, the youngest First Lady in US presidential history. “…History…, everybody kept saying to me put a cold towel around my head” (and wipe the blood off: she is referring to the swearing-in scene at the plane, when Johnson is sworn in at the plant at Love Field and she was beside him)… “later, I saw myself in the mirror; my whole face spattered with blood and hair…I wiped it off with Kleenex. History. I thought no one really wants me there. Then one second later I thought, why did I wash the blood off? I should have left it there, let them see what they’ve done…If I’d just had blood and caked hair when” (they took pictures of swearing in). “Then later I said to Bobby what’s the line between histrionics and drama. In 1995, a year after Jackie’s death, The John F. Kennedy Library in Boston released the interview notes. Another strange, little-known incident that day — US District Judge Sarah Tilghman Hughes, who administered the oath of office to Johnson, and JFK’s Bible and a three-by-five-inch file card containing the oath. Judge Hughes, in the process of stepping down the boarding steps, was hailed by a self-assured man who inquired if she wanted the two items she held in her hand. Assuming he was a security man and because the items did not belong to her, Judge Hughes transferred to the man the file card and the President’s Bible, neither of which were ever located. Kennedy’s assassination will always be clouded in conspiracy, pity and…romance.